Sunday, February 26, 2017 by Isabelle Z. Aging takes a serious toll on humans, and most older people take a lot of pills for various reasons. At first, it might be concerning when family members have to start taking regular medications, but eventually it becomes a new way of life and people stop questioning doctors when they add new pills to an older person’s daily regimen. However, a new analysis published in JAMA Internal Medicine suggests that it might be time to take a closer look at the medications your elderly loved ones are taking. This is particularly true when it comes psychiatric drugs. The number of Americans of retirement age who take at least three psychiatric drugs has jumped twofold in the years between 2004 and 2013. While this is concerning enough on its own, the fact that almost half of these people did not have a single mental health-related diagnosis on record makes this more than concerning – it’s completely unacceptable. Psychiatric drugs have many serious side effects, and older people are particularly susceptible to common side effects like confusion and dizziness. Overprescribing medications to older people has been a problem for a long time, and now there is more evidence that the practice is growing. The analysis looked at data taken from doctors’ visits by people aged 65 or older who were prescribed at least three sleep, psychiatric and/or pain medications. These visits increased by nearly 150 percent during the time period studied, and while the aging population accounts for some of the rise, the bulk of it is being attributed to the increase in prescribing multiple meds. Despite warnings issued by federal health officials that combining sedatives with strong painkillers like opiates is extremely dangerous, those older people who take opiates are still as likely to take two or more other drugs as those who do not take the painkillers. So, why are doctors drugging the elderly? Last year, it was revealed that slightly more than half of antidepressant prescriptions written in the last ten years in Canada were for depression. What about the rest? Doctors hand out these pills like candy for all manner of annoyances and illnesses, including pain, panic disorder, insomnia and fibromyalgia, in addition to off-label conditions they have not gained approval to treat. Doctors sometimes receive kickbacks from pharmaceutical companies for pushing off-label uses of their drugs, so the temptation to make money seems to be overriding any concern for patients’ well-being in these cases. Some patients think that taking an antidepressant when they are not truly depressed is no big deal and may even improve their mood. Unfortunately, the opposite is true. In addition to increasing their risk of type 2 diabetes, heart disease and certain types of cancer, they also raise their suicide risk. One big problem is the aggressive marketing used by Big Pharma, who fill the airwaves with commercials depicting people running happily through grass with cute puppies and telling the public to ask their doctor how a particular pill can make their life better. In addition, Big Pharma has seen to it that the thresholds for diseases like high blood pressure have fallen dramatically so that more people will “need” meds, while those who don’t make the cut can be diagnosed with things like “pre-hypertension” and given different pills, completely ignoring the fact that a good diet and exercise can help improve this condition dramatically. Drugs are also now often given out alongside prescriptions for additional drugs that relieve the side effects caused by the first drug, getting people into the habit of taking multiple medications. The system is deeply flawed, and it is going to take a huge overhaul before real change can be made. 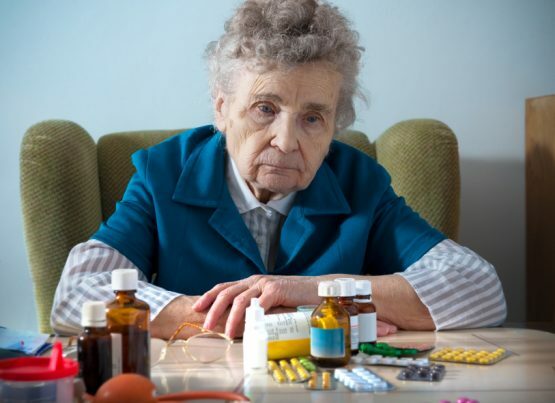 In the meantime, elderly people and their caretakers need to be vigilant and ensure they truly need the medications they are prescribed, getting a second and even third opinion if necessary. In many cases, lifestyle changes and alternative medicine can allow people to bypass pills and their scary side effects altogether.